We always talk about the best lotions and moisturisers but something that we use every single day can actually be the solution or the cause of your dry skin problems. For me, ever since I’ve been on accutane, it’s been a battle finding the right body wash for me. I can’t use heavily scented or foaming body washes anymore because my skin really needs all the moisture and nutrients it can get and because of what I do, I’m always in air conditioning which dries my skin out even more. I’ve always thought body washes for sensitive skin to be foamless, scentless and just plain boring but thanks to Dove, I’ve discovered a body wash I’ve been enjoying using and it’s the Dove Sensitive Body Wash! Unlike most body washes that contain soap which strips the skin of nutrients and moisture during cleansing (resulting in redness or sensitivity), Dove Sensitive Body Wash contains Dove’s milk formulation that does not strip your skin like other body washes. It is hypoallergenic, soap free and clinically tested which helps retain skin nutrients and goes beyond moisturizing to preserve a healthy skin barrier. It is so important to have a body wash that is mild for your skin to use every day. In fact, most body washes contain cleansing ingredients that attach itself to the dirt on your skin so that when water rinses these away, the dirt goes with it. However, these ingredients also attach themselves to protein on the upper layer of skin so that gets stripped away too – leading to skin sensitivity, redness, dryness and irritation. Dove Sensitive Body Wash is different in a way that it uses gentle cleansers that doesn’t strip your skin like other cleansers do and it is mild. It also helps your skin condition to improve through added moisturisers and nutrients. Hypoallergenic, soap free and clinically tested, it goes beyond cleansing and moisturizing to preserve a healthy skin barrier. The Dove Sensitive Body Wash feels a lot like silky milk on your skin and feels even more gentle than my other body washes that I’ve tried. I usually go for these consistencies because it makes my skin soft and gentle to touch. Suprisingly, unlike other mild body washes, this one lathers quite well actually and coats my skin in a soft cloud. It is extremely gentle and not harsh, and when I rinse off, it feels rejuvenated and my skin feels soft and smooth. I have to say that my skin feels much softer and happier compared to how I felt after a shower using my past body washes. Overall, if you’re like me always in that air conditioning and lazy to add lotion up after a shower, you’ll indeed love this. In fact, I just think overall it’s the better choice for you because you should get a body wash that’s mild and gentle for your skin. 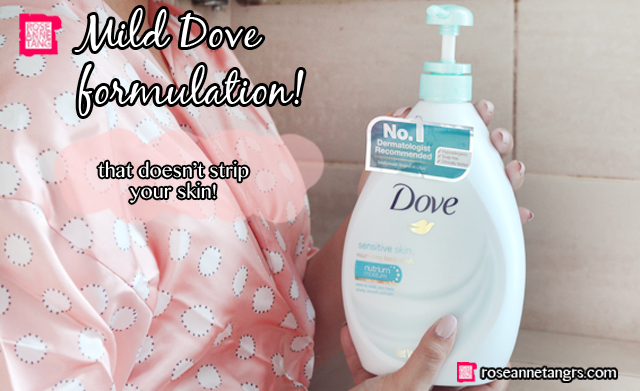 If you’d like to try it for yourself, redeem your free 200ml sample here http://bit.do/Dove ! Hope you liked this post and thank you to Dove for sponsoring and helping me discover this amazing body wash! Review: L'Oreal Mythic Oil, Say Goodbye to Fly-Aways Forever!